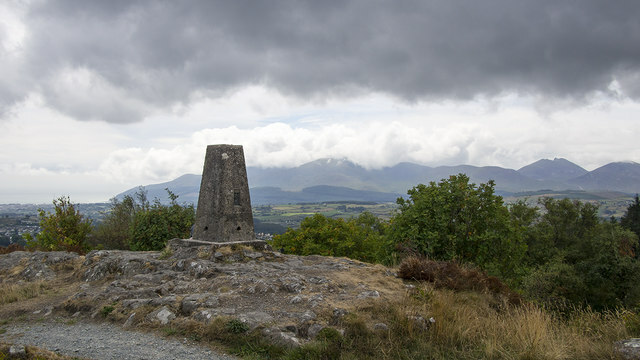 Trig pillar at Slievenaslat in Castlewellan Forest Park. 272m in height and easily accessible on good forest tracks. The view is towards the nearby Mourne Mountains. See also J3337 : Flush Bracket, Slievenaslat Triangulation Pillar and J3337 : Spider, Slievenaslat Triangulation Pillar. The re-triangulation of Northern Ireland by the Ordnance Survey Northern Ireland began in 1950. This was the first complete survey of Northern Ireland which included observations with the new primary triangulation of the country, its connection with the Republic of Ireland and the cross-channel connection between Ireland and Great Britain. This began by OSNI establishing a series of triangulation stations throughout the country. Almost all of these stations were topped by trig pillars and 80, mainly primary and secondary pillars, had been constructed by October 1949. Measurements between primary stations began in 1950 and measurements for these and the secondary stations were completed by July 1956. The construction and measurements for tertiary stations were completed later (probably no later than the mid 1960s). Only two stations are not topped by pillars - Lighthouse Island, marked by a brass rivet, and Ardglass, which utilised the top of a high stone folly. The older triangulation stations on the Lough Foyle Base Line were also re-surveyed as part of this process. A majority of the stations are still extant today but a few have been removed or destroyed.